Kurt Cobain and Ian Curtis. 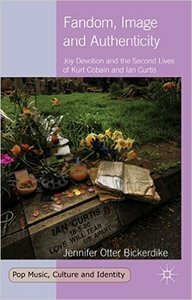 Their early and unexpected deaths propelled them to iconic status as beacons for the values of individuality and authenticity. However, with each passing year, the images of the lead men become farther removed from their original humanity. From Converse to cake, this book examines how their 'brands' lend credibility to commerce, while the increasing worth placed on the singers provides a modern example of a secular belief system propelled by media, technology and the value of immediacy in the 2.0 world. Journeys to spaces and places associated with the two singers are akin to pilgrimages, sacred trips that hope to capture and connect with the very essences that the men have been stripped of in their ever-widening appeal. Within this context, Curtis and Cobain become guides and anglicised role models in the search for personal identity and community in the modern, uncertain world.